LMI Pump Less Motor Chemical Metering Pump Only (No Motor) Models from the G Series are Motor Driven Metering pumps that produce 01. to 300 GPH (Gallons Per Hour). 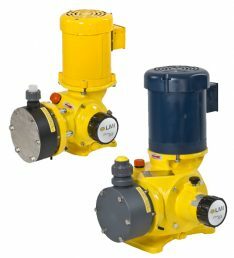 These LMI Pumps are typically used for high output applications for chemicals used in water treatment including process additives, slurry, acids and out gassing fluids. A couple example models are the SD21X2P and the SG76YNP. If you have any question with any of these pump only LMI G Series pumps, give us a call. We will be glad to help you out in any way we can.